Might have to get an idea as to how many for down here to save on postage. I could distribute from here. I'd be looking at 4 in large black for myself. 2 XL in Black 4 me please.. I saw Paul yesterday, Polly has his demo's as evident his post, Richards are on their way. Well to follow up on my review. Having subjected the white tee shirt to many machine washes ...It dont seem to degrade ..colours are just as vivid ...tee shirt holds up good ...All thumbs up here .. Lets wait and see if Richard concurs . I've been quiet for a couple of days just spent in the hospital for a bladder issue. I will spare you the details other than to say that it was not serious, just real effing uncomfortable. Regarding the shirts, everything I've seen in the photos and heard from Polly makes me believe we should get the ordering and distribution functions started right away. It would take a serious flaw in the design or workmanship for me to somehow suggest we needed wait with regard to taking orders. I don't expect that. In any case, my sample should be here any day now and there would be ample time for any comments from me to be considered before production actually began. SIGN UP FOR THE DISTINGUISHED GENTLEMAN'S RIDE!! 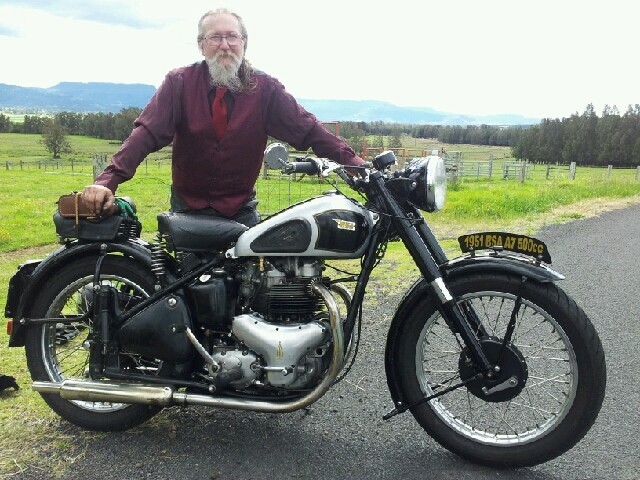 Join one of two forum teams which may be found by searching https://www.gentlemansride.com for "A7". Yippee!!! I'll be looking for 2, size large, when available. Paul and Mark have been busy and designed a web page where you can order and pay for your shirts. The Reckless Promotions website is good as well; certainly better than the DGR site! Easy process, order placed, thanks to all involved. Just ordered mine, easy as, thanks for a job well done.